Handling digital documents have become a part of the daily lives of users and almost everyone is familiar with Microsoft Word. We have seen a lot of Document editing tools and most of them follow the WYSIWYG (‘What you see is what you get’) approach to Word formatting. In such type of Word formatting, a GUI based approach is established and users can visualise the end result while typing out content. That is one way of approaching Word Formatting. Another way is through the use of a Word formatting tool that makes use of the WYSIWYM (‘What you see is what you mean’) approach. Here, the word formatting is done as a markup entry beforehand and then content is added to it later. What is a LaTeX editor? Still don’t get what this is all about? In simple terms, LaTeX (spelled Lay-tek), is a markup level text editing tool that separates the word formatting from the content entry task. Quite similar to HTML in its formatting, LaTeX is one of the most commonly used text editor in the academia. For people having to deal with scientific papers and publishing, with a lot of mathematical equations thrown into the mix, LaTeX text editors are quite the industry standards. These tools allow users to define formatting of text before hand through markup-level instructions and once the content is inserted, the document is ready to be exported as a PDF or any other file format. Mathematical equations are exceptionally handled by these editors and they were the primary reasons leading to its development in the first place. Now that you’ve understood what exactly is the primary purpose of a LaTeX Text editor and how it differs from regular GUI-Based editors, we will be taking a look at some of the best LaTeX tools. So, here are the Best 8 LaTeX editors that will ever need. 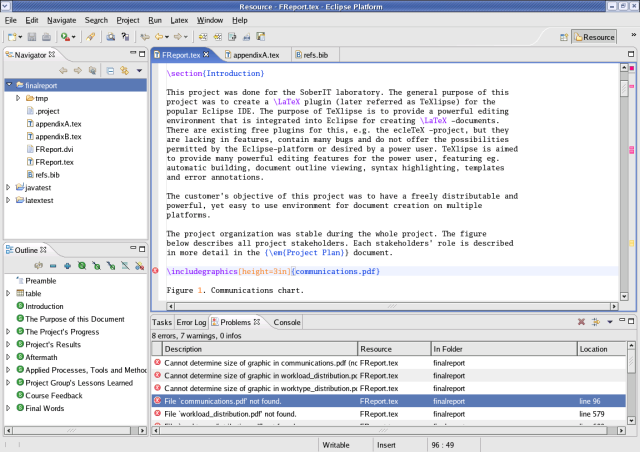 TeXmaker is one of the most popular open-source, multi-platform solution to LaTeX editing. This tool is available for all major platforms and possesses features that make a great case for any LaTeX text editor. To get started with TeXmaker, its configuration window allows users to set-up all the basic settings of their LaTeX document before starting work on it. TeXmaker also allows users to set-up the spell-checking and other document layout settings through the ‘Quick start’ window. The ‘Structure View‘ allows users to streamline their documents into separate sections, labeling each one in the process. Inserting Tables, Math formulae, cross-references, pictures, etc is pretty straightforward with TeXmaker. Once the groundwork of your document layout is set up using TeXmaker, the document can now be compiled to get it extracted as a PDF, HTML or ODF file format. Another key feature of TeXmaker is the way it allows users to track errors during the compilation stage. All warnings and errors are displayed to let the user take the needed action regarding the same. Parts/sections of your documents could be easily folded/unfolded using TeXmaker. This tool is also great for creating a structured Bibliography section of your document. Keyboard short-cuts are abundant for TeXmaker and it makes the overall experience with this tool pretty worthwhile. Key Features: Unicode support, Code folding, Spell-checking, Built-in PDF viewer, Auto-completion, 370 mathematical symbols and more. 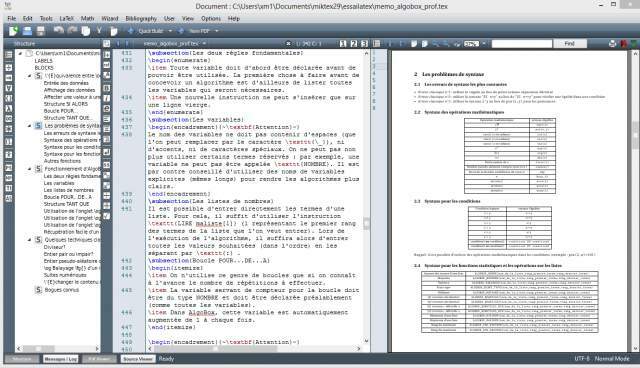 TeXstudio is another open-source and multi-platform LaTeX editor, which is quite popular among the academia. This tool is based on the open-source TeXmaker which we just talked about. TeXstudio is pretty much an extension of the former mentioned tool and added further support and features to it. While the entire interface might pretty much feel similar to TeXmaker, but additional features like Document Word count, frequency count analysis and more made it into an independent full-blown LaTeX editing tool itself. Some of its key features are Syntax Highlighting, reference checking, multi-cursors and more than 1000 mathematical formulae included with it. Citations form a major component of scientific documents and TeXstudio provides support for Link overlay, that converts text into links. The Assistant feature of TeXstudio makes it easy for anyone without the complete knowledge of LaTeX editors set up a file and place blocks of images or tables anywhere in the document. Images could be dragged and dropped into this editor and Table Auto-formatter takes care of adequately formatting your created tables. These are the additional features to TeXstudio, in addition to the regular Structure viewing, Code folding, Spell-checking, Auto-corrections, Syntax highlighting and all the other features that TeXmaker possesses. Key Features: Auto-completion, Insertion of Tables, Figures, Mathematical formulae, Spell-checking, Built-in PDF viewer, Syntax highlighting, Export to HTML and more. Platforms Supported: Windows, Mac OS X, Linux and FreeBSD. 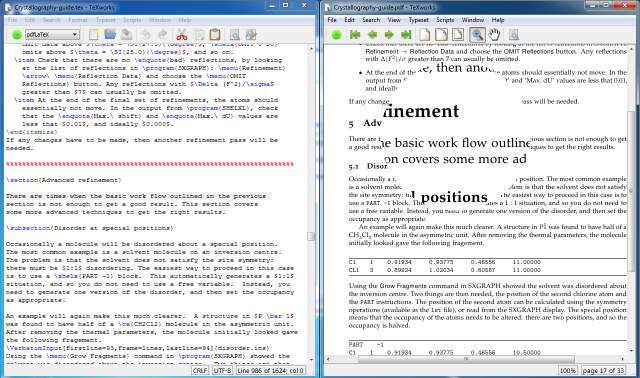 TeXworks is another multi-platform, open-source LaTeX editor. TeXworks is a LaTeX editing tool that is based off another open-source LaTeX editor – TeXshop. It provides a GUI-based approach to LaTeX editing and features many of the key advantages found in the previous mentioned tools. TeXworks features a built-in PDF viewer just like in the above mentioned tools, but this tool also possesses an auto-synchronisation feature to it. TeXworks features many of the key capabilities of a LaTeX editor like auto-completion, auto-correction, Unicode support and more. If only the basic bare bones of a LaTeX editor is required, It ticks in all the boxes perfectly. This tool although does not feature many of the key features, its minimalistic approach to LaTeX editing gets the work done without fussing much about its functionalities. Code folding, Insertion of graphics/tables, interaction with external editors and its powerful built-in PDF viewer and exporter makes this tool one of the best LaTeX editors that the academia often tend to consider. Key Features: Code folding, auto-completion, auto-correction, Unicode support and built-in PDF viewer. If all of the above tools do not interest you in trying out LaTeX editors, here is one that doesn’t need any kinds of installations on your local device. ShareLaTeX takes all of your LaTeX document editing tasks online and now you can edit your documents right from your web browser. One of its key features is the 400 templates that come built-in with it. Among these templates are Technical paper layouts, Scientific magazine articles, CV and more. You can simply choose one such layout and get started on editing your content without worrying much about the formatting associated with it. Other key features of ShareLaTeX is the way it allows users to collaborate on a document. You can now collaborate with other members on your document and visualize changes in real-time. Dragging and dropping of images, external sharing of the completed document, Document History and Chat feature are some of the key advantages of using ShareLaTeX. The Document History allows users to check the revision history of a document and undo changes that were made to the document in the past. Trusted by over 400,000 academia, SharelaTeX is all in all, a powerful LaTeX editor, right from your web browser. Key Features: Collaboration supported, Document history, Dropbox and GitHub syncing supported, Over 400 ready-to-use templates, no installations needed and more. 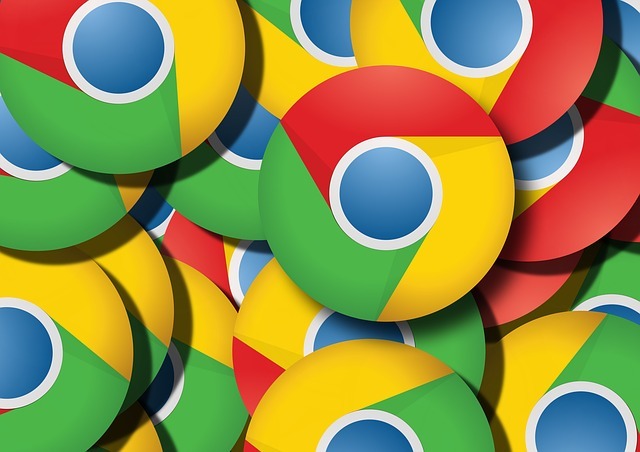 Platforms Supported: Web-based, Supports all major web browsers. Another great online LaTeX editing tool is Overleaf. Trusted by over 200,000 academia worldwide, Overleaf is a great LaTeX editing tool with all the features that make your document creations easy. Overleaf comes with over 100’s of templates ranging from Lab report and Thesis to Resume/CV and formal letters. If starting over fresh isn’t something you’d consider, getting started with one of their many templates is an easy way to develop professionally formatted documents. Among the key features of Overleaf are the ability to collaborate with your team members on technical papers or academia documents. This real-time collaboration brings transparency to the editing work that is being put in by all the authors involved in its development. Your final document could easily be shared to different social networks and Git account using your custom generated link. Make this link as ‘Read-only’ or ‘Read-and-Write’ depending on the person you are sharing the document with. Mathematical formulae insertion is one of the important aspects of LaTeX editors and Overleaf provides a real-time preview of your text as it gets entered. Its Error control and Notation support makes co-authors familiar with WYSIWIG editors easily take up to this tool. Key Features: Real-time collaborations, Effortless sharing, Real-time previewing, Rich Text Editing, Easy error tracking, Document revision history and more. Pricing: Free (Unlimited Collaborates, No Dropbox support, 1 GB storage), $8/mo (10 GB storage, 240 files per project, Dropbox support), $12/mo (20 GB Storage, 500 files per project). If you are looking for more web-based LaTeX editors, Authorea should be a great option for you. Authorea is a great online LaTeX editor, and possesses many of the great features offered by the previously mentioned tools. Ready-to-use templates, Collaboration tools, Document revision history, chat feature, auto-creation of References page, easy insertion of images, links, tables, etc., are some of its key features. Authorea also supports many file formats including LaTeX, HTML, Markdown and more. Creation of an Index page, Exporting document as PDF, Sharing it over social media, Quick Edit, Toggle on/off comments and word count are some of the additional key features of Authorea that makes it one of the best tools for LaTeX editing right from the comforts of your web browser. Insertion of mathematical formulae, images and tables is pretty straightforward with Authorea. All in all, its features make Authorea an easy-to-use LaTeX editing tool with no steep learning curve associated with it. Key Features: Simple insertion of Images, Mathematical formulae, tables and more, Collaborate, Cite papers, Auto-creation of Bibliography, Commenting feature and more. Pricing: Free (1 Private article, Unlimited Collaborates), $5/mo (5 Private articles), $10/mo (10 Private articles), $25/mo (25 Private articles). Vim is another open-source and very powerful editor. Vim-LaTeX is an extension for Vim that lets you edit and compile LaTex documents. It brings the minimalistic and powerful approach to text editing. Use Vim-LaTeX to bring the best of both the worlds into your document editing processes. The extension works with Vim version 6.0 or above. The entire installation process is perfectly documented on their Sourceforge page, which you must definitely pay a visit to. There is another standalone Vim software, known as the gVim that brings a GUI-based interface to the Vim document editor. Vim-LaTeX has been developed specifically for the programmers and it is so highly configurable that it can function anyway, ranging from a simple notepad to all kinds of text editing and also editing of configuration files. Key Features: Visual editing, Mode mapping, Compiling, Error tracking, Code folding, Customized templates and more. Platforms Supported: Windows, Mac OS X, Linux and Unix-based systems. If you are a programmer, chances are pretty high that you might have come across the most flexible Eclipse IDE for your development processes. If you are in need of a powerful LaTeX editing tool within your iteration of Eclipse IDE, TeXlipse is a great plugin which just does that. 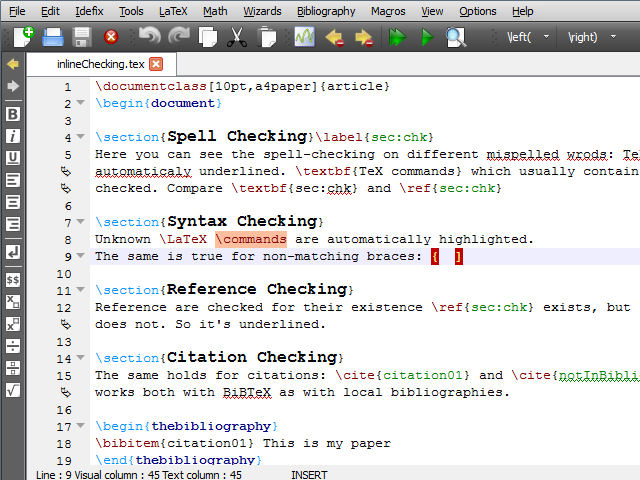 TeXlipse brings the best of LaTeX text editing to your Eclipse IDE program. 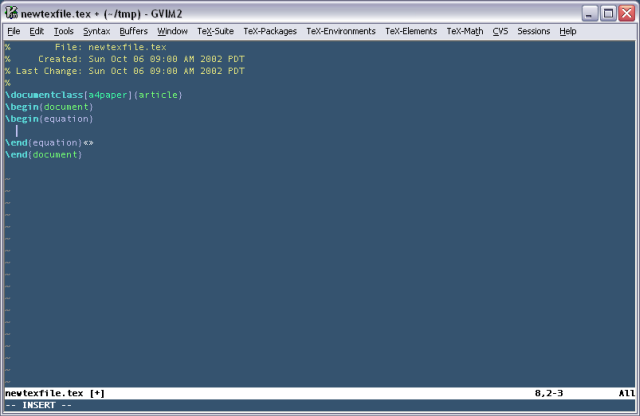 It offers a great WYSIWYM text editor for your programming needs while on Eclipse. Built-in with some of the key features that make up LaTeX editors, TeXlipse is the perfect text editing companion for programmers. For learning more on how to install TeXlipse on your version of Eclipse IDE, head over to their official website for detailed guide on the process. Some of the key features supported by TeXlipse include code commenting, Code folding, word count, Syntax highlighting and indenting, error markers, document templates and more. Project preview allows users to preview the code output and eliminate any potential problems in the process. A must have add-on for programmers based on Eclipse IDE and looking for a powerful document editing tool to go along with it. Key Features: Code commenting, Code folding, Table view, Syntax highlighting/indenting, Word count, error markers, Spell checking, Document templates and more. Platforms Supported: A proper installation of Eclipse IDE on your system. What do you think of these LaTeX text editors for your academia or general purpose usage? Share your thoughts and experiences with these tools below.